Answer the phone and press "1"
The service gave me peace of mind. I stopped worrying about my cats feasting on my deceased body knowing I would be found way before that happened. As an active 88-year-old living alone, I like the reassurance that someone would know if I needed help. My daughter likes the security of knowing she would be contacted if I did not answer the morning call. Thanks, IAMFINE! Leaving the house early for Ash Wednesday services I used the log in function for the first time. I would not be at home for the call. Fast and automatic. I don't have to worry about being injured or dead, and it taking days to find me. Easy to use, if you're not going to be home at your check in time, you can check in online anytime, or call on your cell. I can also put it on hold when I'm gone which is nice. This has been a blessing to have that daily phone call reassuring someone is concerned about my well being. The morning phone call has been reliable coming in at the designated hour. I highly recommend imagine. It is perfect for people like me who live alone and don't have regular 9-5 jobs. Without I would fell like it may take days before anyone would notice that I am not fine. My family has used this service for a couple of years. It works exactly as it should contacting family if there is not a check-in. We' are very happy with it and intend to continue using it. I have forgotten to check in a couple of times and my sons have been notified and I was contacted just as I should have been. I have had this service for almost three years and feel very self assured that I will get that phone call at my appointed time seven days a week. I recommend this service to everyone . Peace of mind knowing that my family will be notified if I don't respond to a call from Iamfine. Also I have two dogs that I know will be rescued in the event something happens to me. It's a great safety net. I am only a few days into my free trial, and already I can tell this service is for me. I am one of the millions of Americans who live alone and do not have a daily work commitment. If you have ever thought, "If something happened to me here at home, no one would know for days or longer", this service is for you. Thank you, I Am Fine! I LOVE this service. I'm not a senior, but I do live alone with my much loved dogs. I used to worry a great deal that something could happen to me and that my dogs would suffer for days before anyone noticed I was "missing". I was so thrilled to find this service this past year, and that the technology was SO well done. I can't even put a value on the peace of mind this service gives me. Thank you!!!! So far, I can't say enuf about the service. It's a great Idea & I wish I had thoughtof it. Kudos to Google. When I asked the question I need a call service for a person who lives alone. "I Am Fine" was 1-- maybe the only service suggested. But the 2 week trial was the kicker! I'm hooked & I look forward to my daily call. I live alone and I always worried that if something happened to me, my dog, Molly, would be alone for possibly days until someone came over or called. 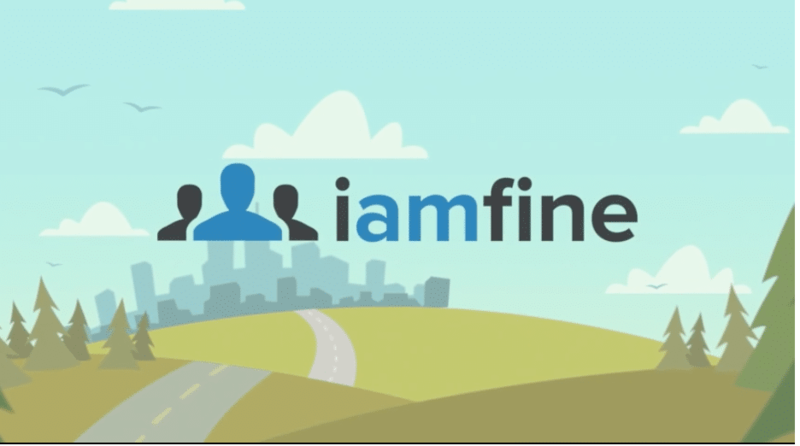 I signed up with Iamfine and I receive an automated phone call every morning. I respond by pressing the number 1 and that lets the service know that I am ok. When you sign up you form a care circle of people you want contacted if you do not respond to the call. Since I joined Iamfine the security and peace of mind that I get from that phone call every morning is worth 10 X what I pay for the service. I love it. No credit card required - only pay if you decide to keep using the service.